In brief: With site meetings in the UES at least once a week, lunch pushes out too late for our usual stroll so we are slowly making our way through some take out places. Co Ba is too far to walk for us, but not to far to be delivered to! 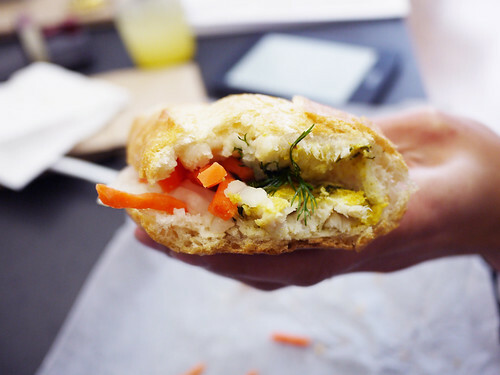 The banh mi come on traditional French baguettes, which changes the texture a bit, but in a nice way. M.'s tried the pho at Co Ba before and liked it, but this cha ca banh mi (catfish sandwich) is all I've had. It's not bad, I'd try more.